White canvas blankets are being used to reflect sunlight. 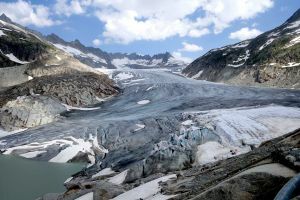 Over the last decade, the Rhone Glacier in the Swiss Alps has been shrinking at a worrying rate. Around 1,148 feet of its ice thickness has been lost since 1856 – and 131 feet of that total has vanished in the last 10 years alone. Locals are taking it upon themselves to do something about this situation. This summer, they will continue a tradition that has stood for the last eight years: wrapping the glacier in blankets, in an attempt to reduce how much ice will melt away. The idea is that the white canvas blankets will be able to reflect sunlight away from the glacier. This might sound outlandish, but it’s having a positive effect. Glaciologist David Volken told the Agence France-Presse (AFP) that the blankets can reduce the amount of ice that melts by around 70 percent, according to a report from NDTV. In fact, the same strategy has been employed in Italy and Germany, E&E News reports. Since 2009, climate researcher Jason Box has advocated using reflective material in this manner to slow ice melt in Greenland. However, this seems to only be a short-term fix. With global temperatures continuing to trend upwards, reflective swaddling can only slow the rate at which ice diminishes, not stop it altogether. While this might offer a reprieve from the most aggressive forecast – Volken told AFP that only 10 percent of the Rhone’s ice volume is expected to remain by the end of the century – it doesn’t solve the problem. Other prospects include the application of artificial snow to reflect sunlight, and the possibility of spraying ocean water over sea ice to make it thicker. As more of the world’s glaciers fall to pieces and reach the point of no return, we may may not be able to wait any longer to take action.